The coral reefs of Key West lie approximately seven miles offshore, and are teeming with an astonishing assortment of ocean life. Such an abundance of marine wildlife cannot be seen all at one single location aside from the Florida Reef, the only living coral reef in North America. The Florida Keys Reef Tract is also the third largest coral barrier reef system in the world, after the Great Barrier Reef in Australia and the Belize Barrier Reef. The reef tract is about four miles wide, extending all the way from Soldier Key to just south of Marquesas Keys, and forms a giant arc which parallels the Florida Keys. 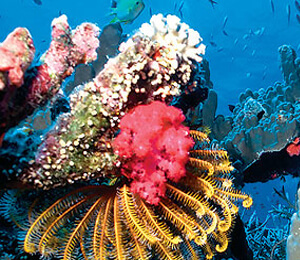 This coral reef forms an elaborate and complex ecosystem filled with tremendous biodiversity. In this coral reef system alone, you can find approximately 110 species of hard and soft coral and over 500 species of tropical reef fish. The reef is also home to sponges, snails, jellyfish, anemones, crabs, lobsters, rays, sea turtles, nurse sharks, and numerous other oceanic life. This coral reef represents millions of years of co-evolution among all these creatures that utilize the ideal underwater environment as shelter or as a source of food. Some of these creatures need one another to coexist. 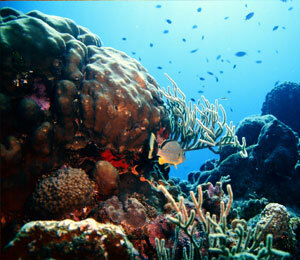 These coral reefs are nearly 5,000 to 7,000 years old, and comprise over 6,000 individual reefs. 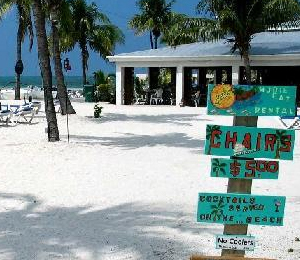 Some of the most impressive of these reef locations are Cottrell Key, the Western Dry Rocks, Sand Key, Rock Key, the Eastern Dry Rocks and the Western Sambo. Coral reefs are made up of tiny organisms called polyps, which sits inside an indentation made of limestone. As the polyps go through their life cycles and die, they leave behind their skeleton. Layers and layers of these skeletons, over time, are cemented together by species of algae, and eventually form the coral reef we know today. You will be astonished by the sheer number of organisms that thrive in this natural habitat. 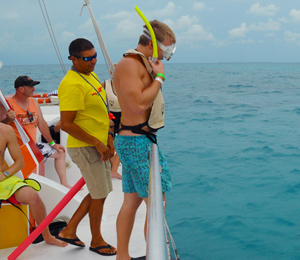 If you get a chance to snorkel, snuba Key West, or take a tour of these impressive coral formations on a glass bottom boat tour, you will be sure to observe a breathtaking assortment of colorful fish fauna, each with their own distinct colors a patters. Witnessing the unmatched beauty of this underwater world teeming with hundreds of species of marine animals is certainly an experience you will never forget.